The Indian travel market is one of the fastest growing in the world and more countries are trying to woo tourists with easy visa plans. Malaysia has always been a favourite for Asian travellers as it provides a reasonably priced experience and enjoys many cultural connections to the sub-continent and more. The e-visa is one such measure that has helped Indian tourist footfall in Malaysia increase drastically. This article lets you know more about how to get tourist visa for Malaysia . If you are looking for information about work visa or student visa, then this article would not help you with that process. We can help you get the right visa for you .We can get you the tourist visas with only 2 documents. You just need to email us these documents. Scanned copies of first and last page of your passport. If you have recently travelled abroad, we then need the exit stamp from that country as well. As Indians, we all know how paperwork can be intimidating, popping at every phase of life and making us go through unplanned excursions negotiating the red tape of countless departments. So when a foreign trip is discussed, all the excitement gets tempered a bit with the documentation details that are required. However, things are much easier now with multiple options including online procured visas and minimal paperwork processes for something as simple as a vacation. Going to Malaysia is an adventure of a lifetime. A healthy bilateral relationship exists between India and Malaysia and recent developments in Malaysia visa requirements for Indian citizens have made visiting this fascinating country even more convenient for Indians. Here are the information, conditions, requirements and options that you need to be aware of to make this trip a dream come true. When it comes to Malaysia tourist visa requirements for Indian citizens, let’s start with the most traditional – the offline approach. An offline visa application is ideal for those who are planning multiple trips. Unlike e-visas which only allow a single entry to Malaysia, a visa procured offline, directly from the consulate allows you multiple entries to the country. Now an offline procedure is a cumbersome process where you will have to spend on your bookings before you even go for your interview. Multiple entries are probably not required for a vacation. The Malaysian government has made things really easy for travelers with the options of Malaysia e-visa and eNTRI visa. With the e-visa option, all your travel planning can be done from the comfort of your keyboard. You do not have to worry about visiting the consulate and going through awkward interview processes and of course, struggling with all the documentation and their really pedantic parameters. Apply for your e-visa services through us and you can just sit back and relax. All you need to do is furnish some basic proofs and documents and leave the running around work to the experts. Let us discuss these easy online options for your Malaysia trip. For just Rs 4000 you can fulfill your Malaysia visa requirements and enjoy a hassle-free experience. A Malaysia e-visa allows a single entry and you can stay in the country for up to 30 days. You can apply for your Malaysia e-visa and get it back in 2 days. The Malaysia e-Visa is valid for only 3 months. Your planned trip will have to fall within this 3 months period otherwise the visa will be void and you will have to re-apply. A Malaysia e-Visa holds good for just one trip, making it an ideal choice for tourists. If you plan to visit Malaysia again within that 3 month period, you will still need to apply for a new e-Visa. If you are someone planning regular trips within a short period, a better option would be to apply offline. The Malaysian e-Visa allows you to stay and travel around the country for not more than 30 days. What Do I need to apply for a Malaysia e-Visa? Documentation is very important for your visa application. Always double-check the details and make sure that the information provided is consistent. First and foremost, keep your passport ready and make sure it has a validity of at least 6 months from the dates of travel. Your passport should have at least 2 blank pages for your Malaysia exit and entry stamps. The applicant’s scanned photograph is required. Specifications state that the picture must be 35mm X 50 mm. Remember that most rejections happen because of wrong photo formats and details. For the e-visa application, your photo image must be in png or jpg format. Ensure that the file size does not exceed 2 MB. You also need to send a scanned copy of your passport’s first page and last page. Make sure scanned copies are clear to avoid further to and fro communication that will eat into your precious time. If you have done any traveling using the passport, then a scanned copy of your last trip stamps will also be needed. A PDF document showing your confirmed Malaysia tickets, both entry, and exit. You can save yourself a lot of hassle by applying for the e-visa via a trusted provider who will arrange this documentation for you. Confirmed proof of accommodation is a crucial part of your Malaysia visa requirements. Once again, you can avoid unnecessary expenditure by applying through a reliable provider who will take care of this documentation and only worry about stay once you have got your e-visa. What is the Cost of a Malaysia e-visa? For INR 4000, you can have a hassle-free experience by applying for an e-visa and enjoy perks like hotel and flight booking assistance, and free insurance consultancy. The e-visa will be delivered to you in 2 days! All you need to furnish are the basic documents listed above. The biggest concern when we apply for a visa is the costs involved just to present a proof of accommodation and the confirmed flights. If the visa does not get approved and there is an unforeseen change of plans, a lot of money is wasted on cancellation fees. Sometimes the loss is total when plane tickets and hotel bookings are non-refundable. This exercise also requires you to have capital to make the bookings in the first place, something very inconvenient when your visa is not even confirmed. These scenarios can cause many sleepless nights, but all this can be averted with the right experts. When you are applying for your e-visa with a trusted facilitator, all your Malaysia visa requirements will be in place, including travel and stay proofs. Get your flights and hotels pre-booked via your visa provider just for the documentation purpose, and maintain the freedom of choosing your own accommodation and flights once the visa is approved. This cost-saving technique is one primary reason you should apply for an e-visa online. With a firm guidance in place to get your Malaysia visa requirements fulfilled, you can be assured that your visa will be approved. 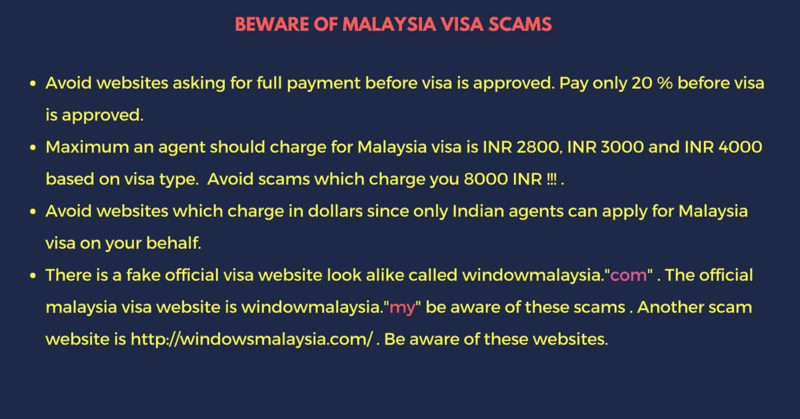 In a worst case and very unlikely scenario where your Malaysia e-visa is not approved, you will get your money back. Travel insurance is mandatory while travelling abroad. It covers certain travel-centric scenarios that regular insurance will not. Loss of belongings, documents, medical emergencies and evacuations are some of the common areas of coverage. You can reach out for assistance when it comes to choosing your travel insurance. Find the best options and get good coverage at a very reasonable price.Why is Travel Insurance important? Earlier in 2017, the Malaysian government added another visa options for travelling Indians. The new eNTRI (Electronic Travel Registration & Information) scheme is ideal for short trips, with a 15 day allowance and with visa fees waived off, it is an even cheaper option. This registration facility is an initiative to facilitate entries under the Visa-Free Program. Introduced in April 2017, the eNTRI scheme is for now expected to go on till March 31st 2018, after which there will be a review to extend the tenure. 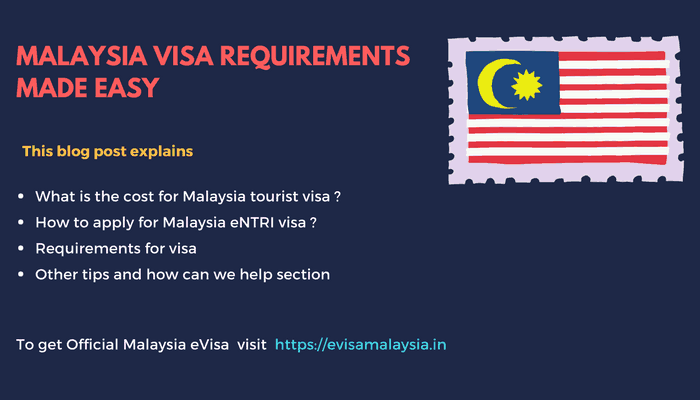 The requirements for the Malaysia eNTRI visas are the same as the e-visa requirements, the time allowance and waived fees being the only major difference. You can apply for the eNTRI and enjoy a hassle-free Malaysia visa procedure for just INR 2800. With such a convenient procedure and service in place, applying for a Malaysia e-visa is now just an afterthought and a formality. Get your documents in place and leave the rest to us. Enjoy exploring a country that is a blend of east and west, and breathes history and culture. From mighty volcanoes to beach sunsets, glitzy shopping paradises to vibrant cultural escapades, all this awaits you in Malaysia. Start planning now.